From silly golfing to corporate espionage, here were our favorite indies we saw at this year's Game Developer's Conference. The Game Developer's Conference is always my favorite big games-related event of the year. Folks in the games industry are all around, mingling, making new friends and meeting old pals, learning more about the industry and opening their ears and eyes to new perspectives. It's also a time where video games run aplenty, of course. Only they're not pushed forth in a fog of commercial blasé like at E3. Over the course of last week, I got the chance to play many independently developed games. Sometimes with a developer happily chatting beside me, other times absorbing the game alone without commentary on the side. What I saw the most at this year's GDC 2018 were indie games stretching beyond the trends that have followed the field in the past. Indie games, as they are unshackled by the higher powers that be, are just doing its own thing, now more than ever before. Here were our favorites that we played and saw during the week-long conference. This game shreds. In tone, I can see people comparing it Doom (2016) one day, or even the ending sequence of Inside. But I see it as Doom, if Doom didn't have that humor to it. I see it as Inside, if Inside was somehow more morbid. Carrion is a game where you play as a gross blobby, alien thing. 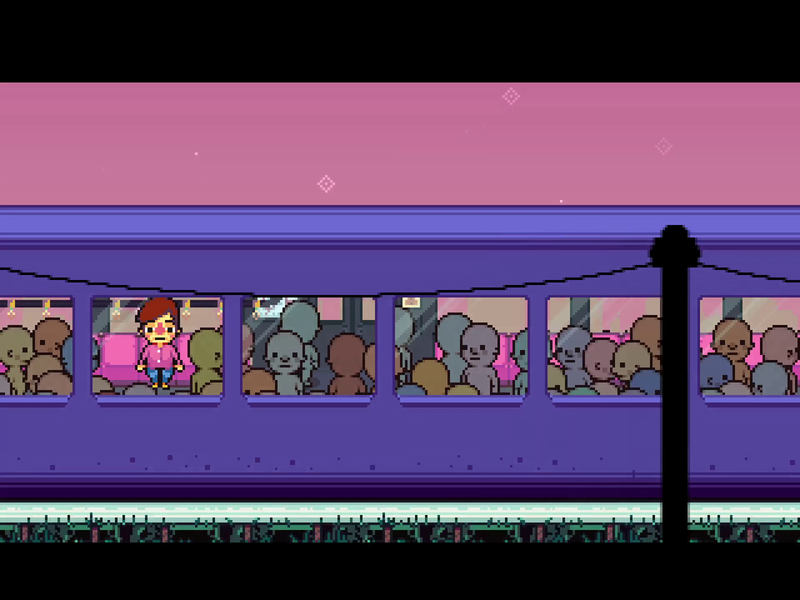 You encounter humans as you fling yourself across the levels. The people are usually armed with guns, which they can shoot you with, but mostly you'll find success consuming them and tearing them apart in horrible ways. It's a deeply unsettling type of platformer with sound design that you won't soon forget. The words "narrative" and "roguelike" don't normally mesh well together, but in Dead Mage's Children of Morta, that's exactly what the focus is. Children of Morta is a beautifully pixelated hack-and-slash game with procedurally generated levels. It also has a core story: the game follows a family of heroes with abilities, battling against Mount Morta's newly monster infested lands. As players progress, they learn more about the mysterious hordes of foes and why they have corrupted the mountain. And visually, it's pretty great in action too. One of the biggest crowds huddled around a screen at this year's GDC event The Mix was the one around Desert Child. It's the sort of game I worry I'll never be good at. There's so much going on, with your bullet-firing motorbike and chaotic, ever-scrolling playing field with obstructions all across your path. It's also exhilarating to just watch, which may account for why its successful Kickstarter campaign and website's page is comprised mostly of gifs of the game in action. Desert Child is a dizzying, lo-fi leaning shoot-'em-up, and it has a lot of style. 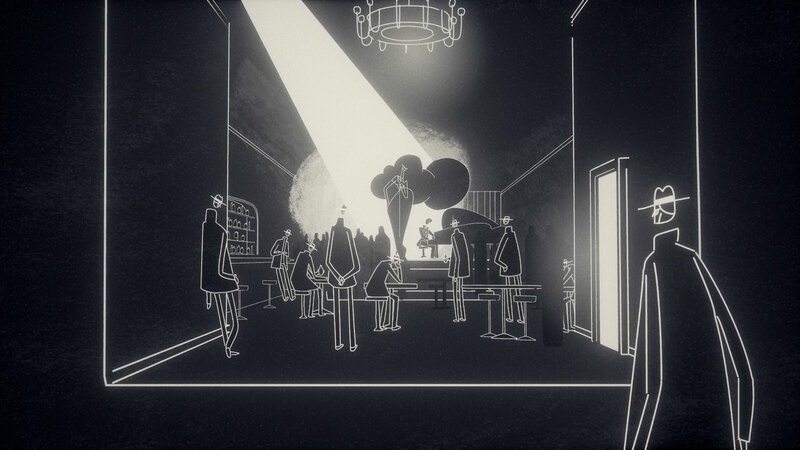 Genesis Noir is a game about the Big Bang, and what happens during, after, and before it. Visually, the game operates like a dream. You navigate puzzles, just as any other adventure game, and cutscenes bleed into being interactive itself. The game is billed as a "poetic" adventure game, and judging from the varying brief instances I've seen of it, I'd say that's a valid sort of descriptor. 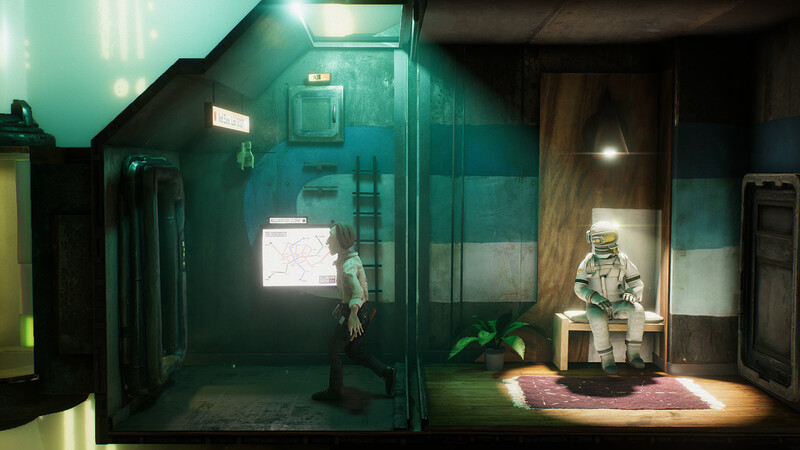 I first saw the adventure game Harold Halibut back in November 2017 for the first time, at Day of the Devs. During GDC 2018, the game appeared in the show floor's own inception of Day of the Devs. Harold Halibut is a game that's been in development for years, with its literally handcrafted characters at last coming to life. It's a stop motion game with a more realistic bent than, say, Wallace and Gromit. (Heck, back at Day of the Devs, one of its developers told me the game is heavily inspired by the work of Tim Burton and Wes Anderson, specifically citing the latter's film The Life Aquatic). IO Interloper was nominated this year for the IGF award for Best Student Game. The game pins you as a hacker, navigating a corporation's employees' personal desktops to crackdown on some unsavory business. The in-game desktop quickly grows unwieldy as you use a Terminal to open up their personal messages, webcams, and more. 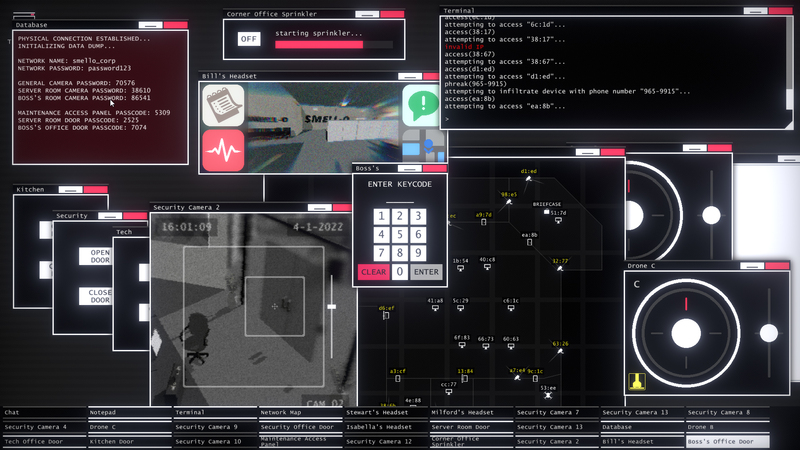 As a wild form of corporate espionage, IO Interloper was the big standout at this year's IGF section of the show floor at GDC 2018. Knuckle Sandwich has been in development for some time now, drawing loads of comparisons over the years of its teasers to Earthbound and more. When I briefly spoke to developer Andrew Brophy at The Mix during GDC 2018, he told me he actually had never even played Earthbound before. His inspirations for the zany pixelated RPG were more rooted in games like WarioWare and Rhythm Heaven—he wants to construct an RPG, minus the usual RPG elements. Judging from the burger serving minigame I unsuccessfully played through, I'd say Knuckle Sandwich may be onto something on that front. In the last decade, there has been a grand resurgence of the 2D, action-platformer. The Messenger, the latest in the genre, is a new Switch and PC game coming later this year. From the start, the game is a typical 8-bit action-platformer. Eventually though, players net the ability to hop between generations, and the game essentially upgrades to a more pristine 16-bit art style, with a Metroidvania world to boot. When our Editor-in-Chief Kat Bailey played the game during GDC 2018, she favorably compared the experience to Shovel Knight. Noita, which was on display at GDC 2018's Day of the Devs section, boasts a world where every pixel, that is every teeny-tiny fragment on the screen, is "simulated." That means it's a world where everything interacts with one another; you can extinguish fires with liquid, if you shoot the ceiling of the cave it will crumble down upon you and the foes you're battling against. Noita is an action-platformer with roguelite sensibilities that's about the environment around you interacting with every single step, even if it leads to destruction. Sokpop Collective, a ragtag team of indie developers, are known for their adorable visual flair and sillier core ideas for video games. Their latest project Original Hill Farming is no exception. On display at this year's Mild Rumpus at GDC, Original Hill Farming reimagines the farming genre in the context of a roguelike. 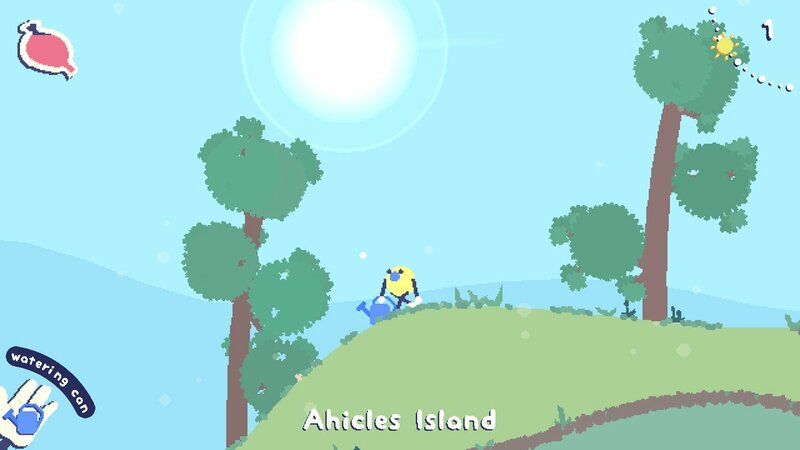 As a sweet little creature, you grow colorful plants across your random island. Sometimes wildlife, and even weather itself, gets in the way too, to add a challenge. Adventure games often have a sense of urgency to them, whether it's solving a mystery or moving a character's story forward. Pikuniku, the new game from developers Sectordub, is the opposite. It's a slow-paced adventure game, with a vibrant color palette and quirky puzzles to solve all along the way. It's also a very silly game, reminding me immediately of Locoroco. There's also a darkness permeating below all of its cutsey exterior, which you learn the more you talk to the NPCs your blob-like hero meets along the way. The PixelJunk series has quietly been one of the most innovative, long-running series in indie games. From shooters to music visualizers, the PixelJunk series has waded into many different genres. Its latest though takes a huge step forward—it's in high definition 3D, no longer stuck within 2D. PixelJunk Monsters 2 is the first true sequel to the popular tower defense game, bringing with it its new visual look and dozens of changes to the core formula. It's a gorgeous game too, showing that the transition to HD didn't take away from the game's core personality. During a brief chat, Q-Games' Founder Dylan Cuthbert told me that the new art style was heavily inspired by Shaun the Sheep and Wallace and Gromit, as the team tried to bring the stop motion vibe to the refreshed character designs of the Tikiman and the Chibis. When I first saw What the Golf?, it was on Twitter within a gif. The image showed a person swinging a golf club, only for the person themselves to be flung across the golf course. 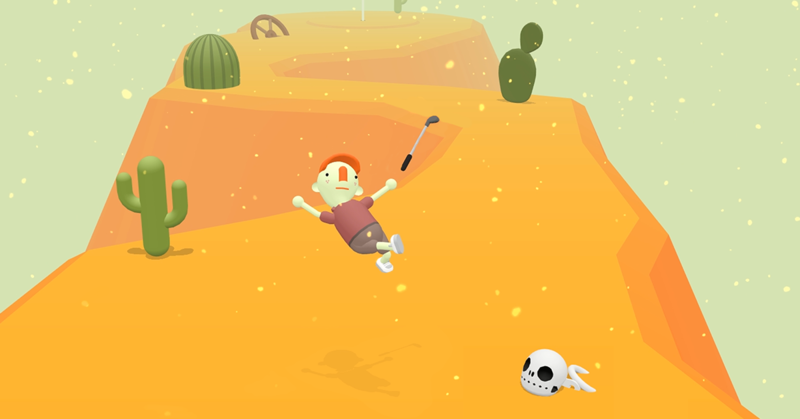 Little did I know, that was only the tip of the goofy antics in store for What the Golf?, a game by a team of developers that have virtually no understanding of golf (as they tell me during a demo on mobile). From Superhot spoofs to movie goofs, What the Golf? won't just be making fun of the art of golf either. If anything, it might amount to being a celebration of all things; because in the end, why can't everything be golf? Tagged with Carrion,	Feature,	Game Developers Conference (GDC),	GDC 2018,	What the Golf?. Message for you: The Messenger is coming to PS4.